Bold and vibrant! You cannot make a better choice once you make up your mind to go for this beautiful designer kurti with sweeping prints in the front. Subtle and bright at the same time, this super fine georgette kurti can be easily worn at formal occasions instead of the boring, heavy garments that give you an unreal appearance. 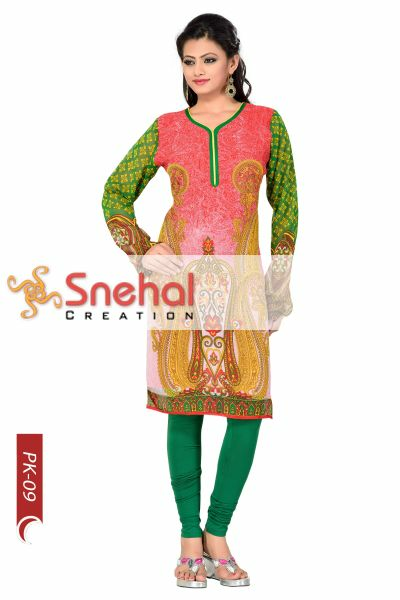 The light kurti can be paired with a churidar of your choice while the beige- green and pink combination along with the completely contrasting design at the back is sure to turn all eyes your way. Feel free to the jewelry of your choice in order to look enticing in this lovely kurti. AVAILABLE IN DIFFERENT COLORS.